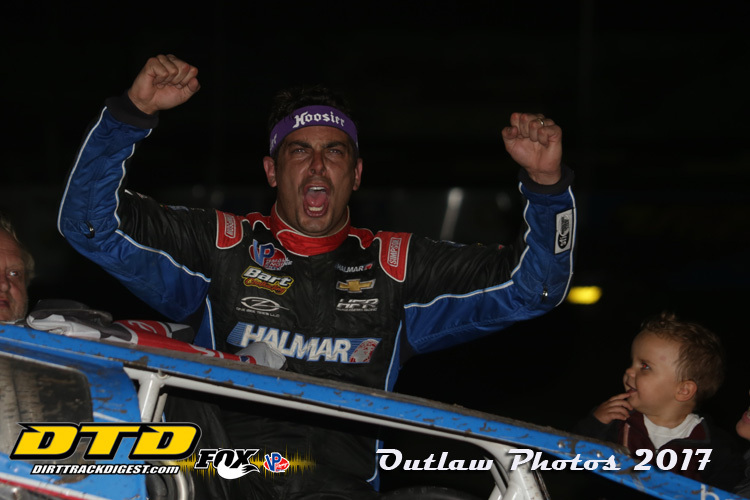 BRIDGEPORT, NJ – When the Bridgeport Speedway throws open their gates for the start of the 2018 racing season, Stewart Friesen and his Halimar No. 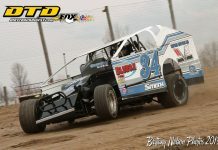 44 team will be on hand to defend their title in the 60 Over Special – Doug Hoffman Memorial event. The connection between Friesen and Hoffman runs deep. “I was always a fan,” Friesen went on to explain. “Doug would run the DIRTcar races and come up to Ransomville.” The Friesen family promoted races at the Ransomville Speedway. “And, of course, we’d see him on the Pennsylvania swing when we’d come to Grandview and then at Syracuse.” Friesen’s uncle, Alex Friesen, had a long term working relationship with Doug Hoffman. The two driver/promoters co-promoted together for a while at the Mahoning Valley Speedway. “As a matter of fact, my uncle ran Doug’s car at Syracuse the year Doug won (the Fay’s 300). Doug raced Billy Taylor’s car that year and Alex ran Doug’s car so he got to share in that celebration.” “Doug’s memorial race was a big one on our hit list,” Friesen added. Friesen has also worn the promoter’s hat in the past. Those experiences have given Friesen some insight and respect for the role that race promoters play. “I definitely appreciate what these guys put into it. It’s a thankless job,” Friesen said of promoting races. It was clear that he prefers his job behind the wheel. Freisen came close to winning the inaugural 60 Over Special. He had the lead on the final lap but his Marty Burdick owned mount ran low on fuel as the field headed into the final turn. It was a mad dash to the finish as cars were crashing as they came down the homestretch but it was Bobby Varin who raced to the finish line for the victory. 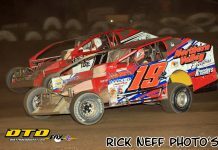 Last year’s event held its own level of excitement as Jeff Strunk raced into the lead on lap fourteen in the Hyneman No 126. With just ten laps to go, the No. 126 lost some of its speed as the tone of the engine changed. A restart with just two laps to go was Strunk’s undoing as as Friesen raced into the lead with just a little more than a lap to go. Strunk held on to finish second with Duane Howard in third. Friesen has a large fan following – and even more so since his move into the NASCAR ranks. Friesen took time to spend with the fans at Bridgeport last season – staying behind the grandstand until every last fan had had their chance for autographs and conversation. The 60 Over Special – Doug Hoffman Memorial is a two day event. 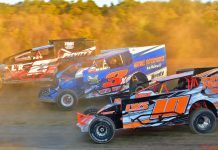 On Friday, March 30th, racing will get underway at 7:30pm as the Small Block Modifieds are featured along with the Pennco Tech Outlaw Stocks and first race for the 2018 DA’s Auto Body & Repairs Rookies. There will also be an open practice session for the Spirit Auto Center Big Block Modifieds and 602 Crate Sportsman. The next day, on Saturday, March 31st, race time is 4pm for the Spirit Auto Center Big Block Modifieds, Stewart Stainless 602 Crate Sportsman and Pennco Tech Outlaw Stocks in the first hand of the 2018 811 Dig Safe Poker Series. The Bridgeport Speedway will be open for practice at noon, this Saturday. Practice sessions will take place on both the 5/8th mile and quarter mile speedways. A Sunday rain date is in place for this practice session.